Camping Club le Trianon is a brilliant 5 star campsite that occupies a fabulous countryside location at Olonne-sur-Mer near to the busy seaside resort of Les Sables d’Olonne. Covering over 12 hectares Camping Club le Trianon is a very spacious campsite that is aimed at providing you the very best in camping holiday experiences. The campsite is very well maintained and the trees, plants and flowers that are present not only ensure you have a degree of privacy but also allow you to relax. The nearest beach to Camping Club le Trianon is approximately 5km away however the campsite does offer a free shuttle bus to and from the beach in high season to ensure that if you do want to leave and enjoy a day at the seaside then you can with little effort. Olonne-sur-Mer is within walking distance of the campsite and is great for all of your day to day necessities however we suggest you take a trip to Les Sables d’Olonne at some point during your stay. There is a whole range of different things to do and see there from a zoo to the fabulous beach and marina, you won’t be disappointed. The swimming pool at Camping Club le Trianon is second to none in the area offering a fantastic place for all the family to have fun. Sit back and relax on one of the many sun loungers or take a dip in one of the pools, the choice is yours. 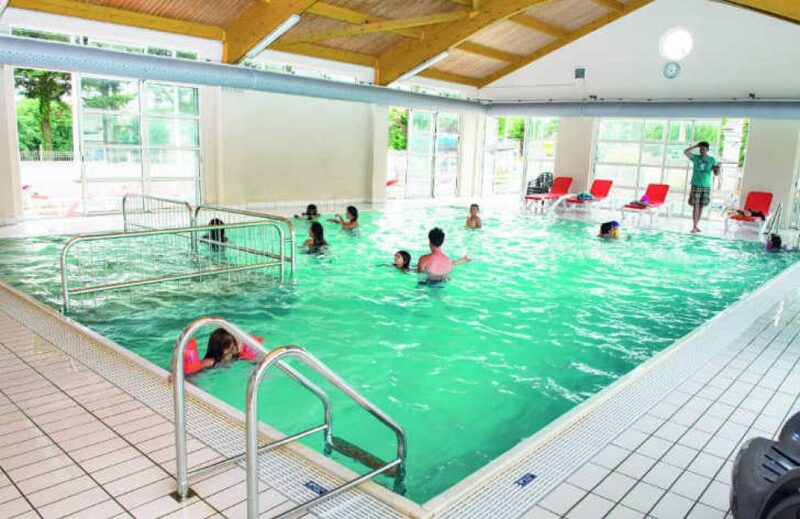 The indoor area of the pool includes a heated pool and paddling pool whilst the outdoor aquatic area boasts a massive swimming pool, a tropical lagoon area, a second children’s play area and 6 water slides including a brilliant space bowl slide. Camping Club le Trianon boasts a fantastic location and a great pool complex but the benefits don’t stop there as the rest of the activities and facilities are also excellent. On site activities at Camping Club le Trianon include multi sports court, gym, boules, beach volleyball, badminton, football, basketball, tennis, table tennis, fishing in an on site pond, crazy golf, aquafun, wellness centre, sports tournaments and cycle hire. Facilities available at Camping Club le Trianon campsite include WIFI, restaurant, snack bar, take away, bar, animation team, grocery shop games room, tv room, washers and dryers. Accommodation at Camping Club le Trianon includes 2 and 3 bedroom mobile homes that are available from Brittany Ferries.